"Moore’s compassionate performance confirms the strength of the original and its beloved heroine’s universal appeal. 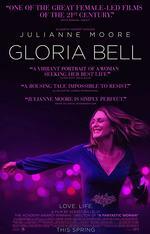 More than that, GLORIA BELL proves that the best stories can be told endlessly, so long as they’re told well." "Because of Moore's open-hearted, captivating portrayal of the title character, repetition won't be a drawback for those who've seen Gloria. She makes the role her own with brio and woman-power strength." "The comedy is far more subtle and elusive than laugh-out-loud. It’s a reflective, even occasionally tedious slice of daily life that relies on Moore to sell its dullest interludes — sequences that aren’t made any livelier by Lelio’s parched, washed-out visual design"